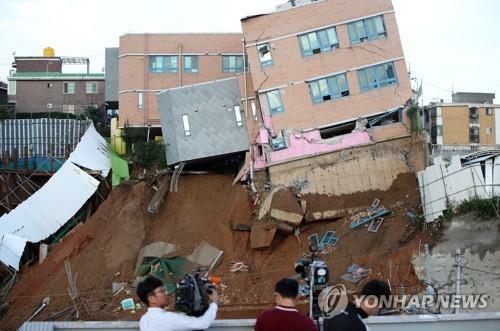 SEOUL, Sept. 7 (Yonhap) — A kindergarten building in southern Seoul has tilted after a retaining wall at a nearby construction site collapsed, authorities said Friday. No one was injured. The four-story Seoul Sangdo Kindergarten, located in the southern district of Dongjak, lent at about 10 degrees as the wall designed to prevent subsidence caved in for unidentified reasons late Wednesday night, local firefighters and police said. No casualties were reported as the building was empty. The authorities sent rescue teams and investigators to the site as soon as they received the report at 11:22 p.m. As of early Friday, 148 people have been dispatched to the scene, with 34 vehicles, including fire engines. The Dongjak ward office has set up a temporary shelter for residents who evacuated. The accident came only a week after a large sinkhole opened near an apartment complex in a southwestern district of Gasan, adding to growing woes about ground failures near construction sites. Seoul Education Superintendent Cho Hee-yeon paid a visit to the site and met the preschool officials to discuss the situation. An official from the kindergarten told Cho they repeatedly complained to the construction company of cracks being developed on floors and it did nothing about it. A safety inspection had already been under way for the Sangdo kindergarten, according to its officials. No serious flaws were found in June and July measurements, but in August, the inspection found some potential risks. A day before the collapse, the kindergarten principal, officials from the ward office and construction company held a meeting over the issue. The builder promised to come up with measures to ensure safety. Cho took a swipe at lax regulations that allow construction near schools and called for tougher laws to prioritize people’s safety. “It makes no sense that we’re letting construction go ahead right next to a preschool,” he said. Police said the retaining wall — 20 meters high and 50 meters wide — was incomplete and about 80 percent of the structure has been destroyed. The authorities believe part of the ground on which the kindergarten stands suddenly subsided and crumbled into the construction site, causing the tilting. Police said they will continue efforts to find out the exact cause of the collapse.